Civil Defence volunteers in Kildare are on course for a record year in terms of activity, according to new figures obtained by Fine Gael TD and chairman of the Parliamentary Party, Martin Heydon. Nationwide, Civil Defence teams have already taken part in almost 1500 duties in the first six months of 2018. These range from missing person searches, supporting the emergency services and assisting with community events. According to Deputy Heydon, new figures show that the Civil Defence units in Kildare engaged in 61 duties in the first six months of the year. This compares to 71 for the entire of last year and 67 duties in 2017. “Our Civil Defence volunteers in Kildare are doing us extremely proud, as illustrated by these latest figures,” Deputy Heydon said. “They make a huge commitment to our communities – and are always on standby to assist other agencies when called upon. “Based on these figures, the Civil Defence in Kildare are on course to surpass previous years in terms of activity. I know many of the volunteers devote so much personal time to the Civil Defence organisation, fuelled by their love of volunteerism. Civil Defence played a major role in the recent papal visit to both the Phoenix Park and Knock. And as seen during the severe weather periods, Civil Defence volunteers were at the forefront of the response efforts. Civil Defence has 3,500 volunteers based in every Local Authority area in the country. Civil Defence has a wide range of equipment to deal with severe weather including 88 Boats, 47 Fire Tenders, 9 Floating Pontoon Units and 130 Four Wheel Drive vehicles. Volunteers join Civil Defence through their local authority. Initial training is delivered locally. 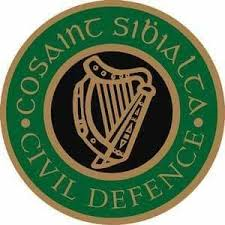 Advanced training takes place at the Civil Defence College in Roscrea, Co Tipperary. Civil Defence Units are located in each county in the Republic of Ireland. To request information on becoming a Civil Defence volunteer, or have a member of Civil Defence contact you, please visit https://www.civildefence.ie/ contact/.